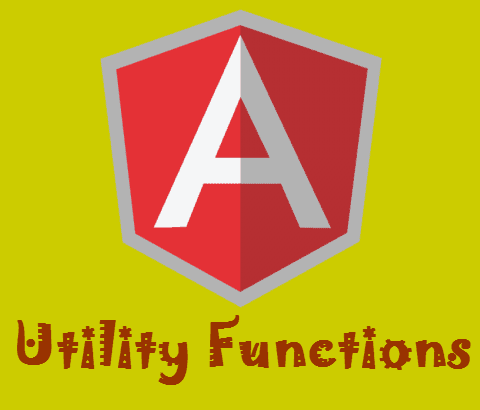 Here is a quick and short summary of mostly used AngularJS utility functions. These short summary will be quick help you to find out desired function. angular.bootstrap - To manually start up angular application. angular.copy - Creates a deep copy of source, which should be an object or an array..
angular.extend - Copy methods and properties from one object to another. angular.element - Wraps a raw DOM element or HTML string as a jQuery element. angular.equals - Determines if two objects or two values are equivalent. angular.forEach - Enumerate the content of a collection. angular.fromJson - Deserializes a JSON string. angular.toJson - Serializes input into a JSON-formatted string. angular.isArray - Determines if a reference is an Array. angular.isDate - Determines if a value is a date. angular.isDefined - Determines if a reference is defined. angular.isElement - Determines if a reference is a DOM element. angular.isFunction - Determines if a reference is a Function. angular.isNumber - Determines if a reference is a Number. angular.isObject - Determines if a reference is an Object. angular.isString - Determines if a reference is a String. angular.isUndefined - Determines if a reference is undefined. angular.lowercase - Converts the specified string to lowercase. angular.uppercase - Converts the specified string to uppercase.